For fines separation the centrifuge type separator has proven its function in the field due to the simple design and dependibilty. The most common gas type cyclone is mainly used in the wood, plastic and cement industries and through pneumatic transport in the chemical and food industries. In the inner portion of the cyclone, the particle/gas mixture is transformed into a rotational direction. A centrifuge effect is created and moves the particles in a radial direction toward the outside of the inner cyclone walls. The particles are thus centrifically removed from the gas stream flow. Cyclones are used for massive as well as flowing particles. A cylindrical container with conical lower area allows the gas to tangenically react through various inlet geometries. The inlet geometries create a rotational flow of the gases inside the cyclone. Through the circular air stream the designated particles for separation are sedimented and forced by centrifugal motion toward the outer wall of the separation area. These particles are directed in a spiral stream form in a downward motion along the conus and discharge to the dust bin container. A larger portion of the particles are centrifugally forced directly at the inlet area of the cyclone. Abrasive dusts can cause excessive wear at the inlet of the cyclone. Engineering office Paul König offers a cyclone that is designed to cope with these type of abrasive dusts. Cyclone separators with spiral inlets. The spiral inlet design alters the air flow to a rectangular form and the spiral is manufactured with reinforced steel. The standard cyclones utilize a pipe type inlet. The pipe inlet design creates a tangential pipe form that is directed into the cylindrical upper housing. This cyclone design is standard and more economical. 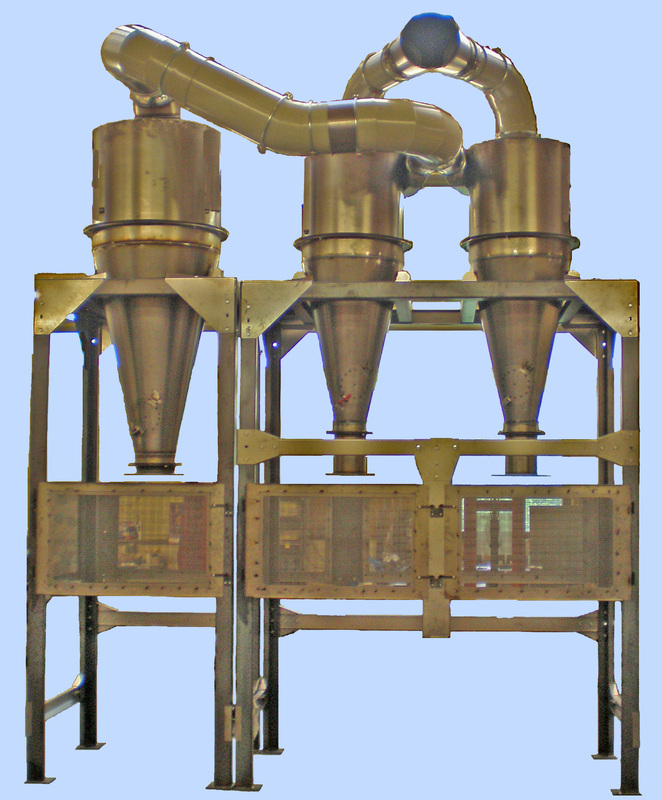 There are different methods to separate the discharging dust. 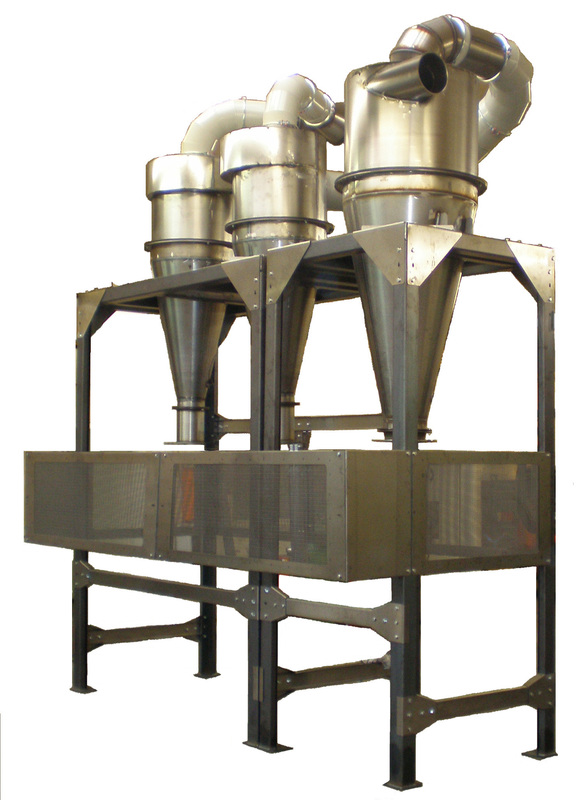 A container or including a conical apex to prevent the rotational flow from exiting in the buffer which would otherwise allow the separated particles to flow with the dust. Caution must be taken to ensure that the use of the conical apex does not result in blockage. The use of discharge accessories such as rotary valves or double pendulum valves which serve to prevent gas discharge can cause the dust to exit from the cyclone. The gases are forced to discharge at the top of the cyclone rather then at the bottom. The gases exits the cyclone in a radial flow from outwards to inwards and flows through the depth pipe in a upward motion to the top of the cyclone. The depth pipe is a vital part of the cyclone which determines the centrifugal force and finally the separation efficiency and pressure loss.